Summary: On one side of the border lies the modern world: the internet, homecoming dances, cell phones. On the other side dwell the ancient monsters who spark humanity’s deepest fears: dragons. Seventeen-year-old Kay Wyatt knows she’s breaking the law by rock climbing near the border, but she’d rather have an adventure than follow the rules. When the dragon Artegal unexpectedly saves her life, a secret friendship grows between them—even though the fragile truce that has maintained peace between their two species is unraveling around them. As tensions mount and battles begin, Kay and Artegal are caught in the middle. Can their friendship change the course of a war? In her young adult debut, New York Times bestselling author Carrie Vaughn presents a modern tale of myths and machines and an alliance that crosses a seemingly unbridgeable divide. Cool! This book looks great. This book looks so good! Thanks for hosting this contest! Looks like a good read. Count me in please. a book about dragons? yes please!! I love dragon stories. I'd love to read it. I've had this on my TBR list for a long time! 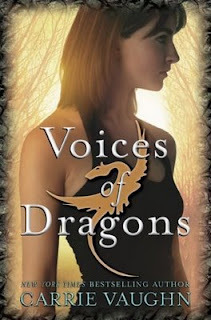 Can I just say I love dragons...and I want this book really bad? This one looks super good! Oh wow, I've really, REALLY been wanting to read this one! Please enter me. Ohhh! I LOVE this cover! Heard great things about this story too! Please sign me up for this one! Loved Vaughn's "Kitty" books and know this will be the start of a great series. Oooh definitely count me in, please! I'd love to win this one. Love this cover! Thanks for the entry. I love Vaughn's other adult series, I so wanna get my claws on this! This looks like another great book. Thanks for the contest. I would like to enter. I haven't read any books like this. It sounds really good. Enter me please! Want to read this one so bad! Sounds different but good! Thanks for all the contests! Thanks so much, please count me in! Great book, it sounds cool. Want to read this one too. I've heard good things about this book! Please include me! I'm really interested in reading this! This looks great! PLease enter m! I so want to read this book!! Please enter me in the contest!! Oh, I really want this one!! I would love to be entered. Ooh I would love to win this one! I reeeeally want to own a lovely copy of this one! I love books with dragons. Please throw my name in the hat. Oh man! I have been wanting to read this! This one sounds awesome, too! I would love to win this one. I love her other series so I'm sure this will be good as well. I'm dying to read this one as well! thanks! Yah Great ! Its International. Just got back from a weekend away and saw this post. I'm so glad this is international! Please enter me.